There's nothing like waiting until the last minute to finish something. Yah, ok. Right. This morning, sometime during brunch, my mom mentions she wanted (this was her way of asking for my help) to make a little clutch to put a gift certificate in for my cousin's Christmas gift. Ok, not a big deal. Except that this Christmas get together was less than two hours away (which inludes a 45 minute drive time). Ekk! Needless to say, this little guy was completed in less than an hour. 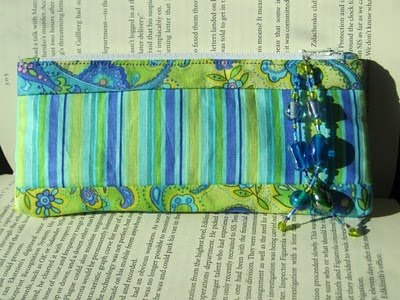 The pattern is called Cash and Carry by Terry Atkinson. 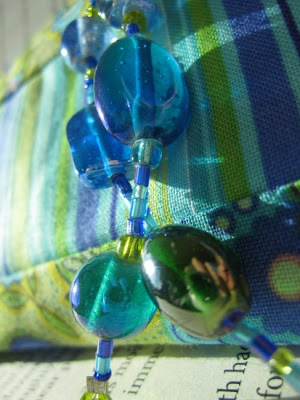 Close up on the hand beaded zipper pull. I hope everyone had a wonderful Christmas weekend!